The worst Typhoon to hit Japan in over 25 years is ravaging the island nation including its major cities such as Kyoto and Osaka. The storm has already claimed 10 lives with over 300 injuries reported. The typhoon has also left over one million homes without power. Evacuation advisories were issued Wednesday for over 1.2 million of the population after the storm made landfall Tuesday afternoon. 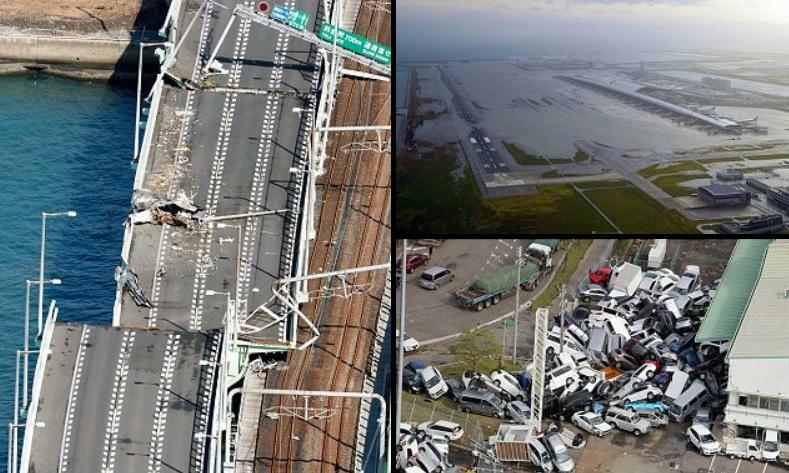 Because of the strong winds, over 3,000 people have been stranded at Osaka's Kansai International Airport. Those people are being ferried by boat to another airport, according to officials. The Kansai International Airport is built on an artificial island and a tanker crashed into the bridge connecting it to the mainland. It has had its runways and basements flooded and is expected to remain closed at least all of Wednesday. The typhoon has also caused not only flights but trains and ferries to be canceled as well. Residents are being advised to stay alert for landslides and floods. Another 30,000 in Japan have been strongly urged to evacuate although the orders were not mandatory. Photos and video uploaded to social media showed spectacular sights straight out of disaster films with giant oil tankers broken in half, bridges severed, and cars piled into heaps as if they were just toys. Japan lost 10 lives in what is really cat 5 hurricane to us. Maybe we need to review Japan plannings?